When local news outlets first reported that Dr. Suwaibah Muhammad Nasir was seeking US$1 million (RM4.1 million) in order to complete a Humanitarian Tour to Conquer 30 of the World’s Tallest Towers, more than a few eyebrows were raised. If that seems like way more money than would be necessary to run up 30 of the world’s tallest towers, you are not alone. Dr. Suwaibah, an honorary major in the Malaysian army, explained last week that she needed the funds to cover the “high costs of accommodation, airline tickets, visa applications, and related matter to complete the mission,” which will apparently require a 10-person team, including several air force personnel. Not buying any of this is internationally recognized, tower-running athlete Soh Wai Ching, a fellow Malaysian who’s actually an elite athlete in the sport. 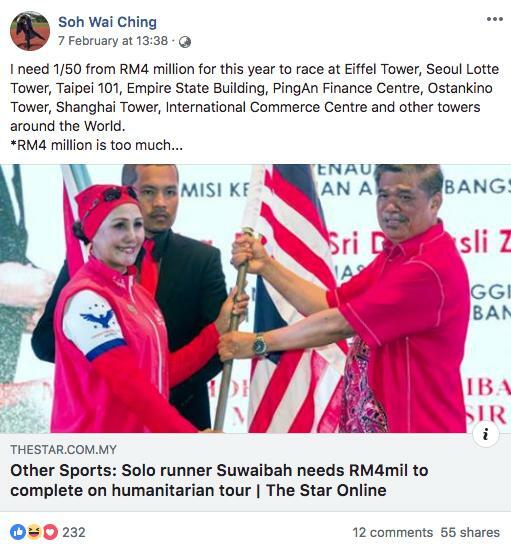 Posting an article outlining Dr. Suwaibah’s funding objective to his Facebook page, Soh, the only top-level Asian entrant in the upcoming Eiffel Tower run, wrote that for all of his races around the world, he only needed about 1/50th of what the good doctor was asking for. Including travel and accommodation, US$20,000 is enough to get the top-ranking athlete to not only the Eiffel Tower run in France, but also the Seoul Lotte Tower in Korea, Tapei 101 in Taiwan, the Empire State Building in the United States, and many other international locations. Taking his criticisms a step further, he pointed out a variety of ways you could usefully spend a million US dollars, including buying 200,000 bags of rice for the poor, or funding the education of impoverished children. More importantly, he wondered aloud why Malaysian Defense Minister Mat Sabu felt the need to publicly endorse someone like Dr. Suwaibah, when athletes like Soh, who were actually setting international records, were being largely ignored when it came to national press and funding. “There is nothing humanitarian about this personal goal,” he wrote, with many of his and Soh’s followers agreeing. 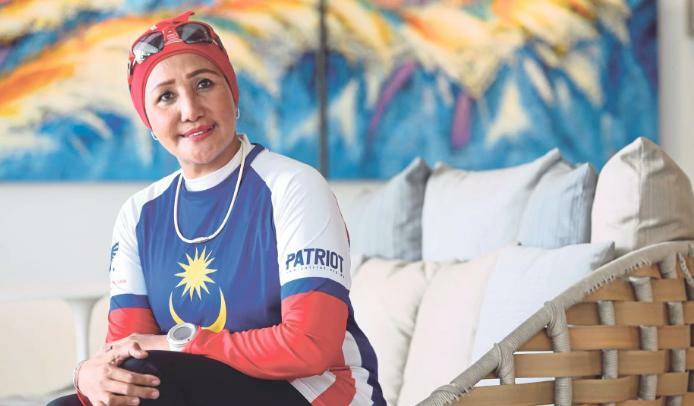 After days of swirling criticism, Dr. Suwaibah fired back in Free Malaysia Today to clarify that the RM4 million was not for her: “I don’t want to pocket it,” she said. She added that the money would also be used to fund refugee camps and welfare in the countries she is planning to visit — though she did not specify which countries or causes she planned to donate to. 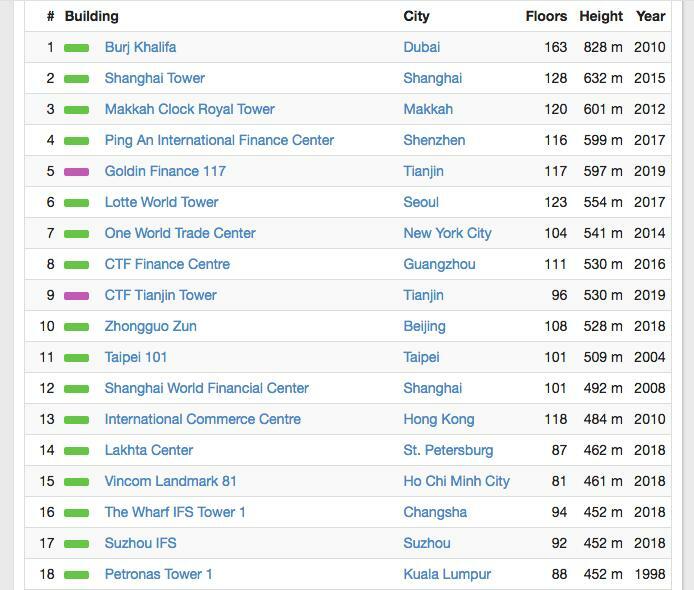 Many of the countries listed on the world’s tallest buildings index don’t actually, y’know, have refugee camps. Coconuts KL was unable to find an organization bearing that exact name; however, we did find an international organization named the World Peace Council, although according to their detailed Wikipedia page, they have no affiliates in Malaysia. This article, Netizens balk at athlete’s request of RM4 million for ‘humanitarian’ world tour, originally appeared on Coconuts, Asia's leading alternative media company. Want more Coconuts? Sign up for our newsletters!